Which Agent Do I Call? This graphic is a great example of what happens to a home that is for sale in today's tech-loving world. A home is listed with a selling agent and then is quickly disbursed to hundreds of sites and can be easily found for the prospective buyer. This is very convenient for both buyer and seller! The sellers home is reaching more prospective buyers than ever before and the buyers are able to get notifications the minute a home hits the market that meets their requirements. Buyers now have the ability to browse for their dream home from a multitude of sites such as Zillow, Trulia and Realtor.com that show homes and properties for sale in a certain geographic location from all the listing agents. Really convienent for the prospective buyer and confusing as well! Who do I call to show me the home I just saw? The agent that is selling the property? The agent that I have been using? The agent who I saw on the ad on the website? Prospective buyers should call the agent that they have been working with to show them the property that they're interested in. Your agent knows you, your needs and your wants. It's perfectly acceptable to have your agent show you a home that is listed with another agent. Additionally, it is of utmost importance that you're with an agent that you trust and have that personal relationship with. While the speed in which we get information is getting quicker, the value of human relationships will never be outdone. 1. They’re reusable. As long as you have paid off your VA loan, you can use your full entitlement again. 2. Only certain types of homes can qualify for your loan. Many “fixer-upper” types of homes or businesses may not qualify. If it is a move-in ready home or condo, you should be ready to go. 3. The loans are not for recreational “camps” or vacation homes or investment properties. They are designed to provide a primary residence for you. 4. The VA does not give you the money. What the VA does is to guarantee the qualifying mortgages. 5. The loans are guaranteed by the federal government. This gives veterans good terms and rates in their loans, because the USA government guarantees about a quarter of the loan and reduces risk to the lender. 6. If you are putting less than 20 percent down, you do not have to pay mortgage insurance. The VA’s guarantee saves veterans money each month by eliminating this premium. 7. There is a mandatory fee. It may run about 2 percent of the loan amount. This is the VA Funding Fee. It helps keep the program running for you and other veterans. 8. There is a limit on co-borrowers. Many mortgages will let you get a loan with about anybody. Usually the co-borrower needs to be a spouse or another veteran who will live in the house with you. Check with your lender for restrictions. 9. They are available even if you have a history of foreclosure or bankruptcy. You can still use your VA loan benefit. 10. They do not carry a prepayment penalty. You can make extra payments any time you are able. Even if you can only apply a little extra cash to paying off your mortgage each month, you can pay off the mortgage years earlier and save thousands of dollars. 11. After establishing that you are eligible, you will need a Certificate of Eligibility (COE). The COE verifies to the lender that you are eligible for a VA-backed loan. The U.S. Department of Veterans Affairs website can help you determine what forms you need for your particular military service experience. 12. See your lender to get a preapproval for your VA loan as a first step. Then you are ready to make an offer when that dream home becomes available. Please call Grove City Realty if you have questions. We help buyers work with lenders everyday. Let us help you find a great home at a great price. This article is a brief summary. Check out these websites and your lender for information suited to your unique situation. We thank you for your service to our nation. A USDA home loan from the USDA loan program, is a mortgage loan offered to rural property owners by the United States Department of Agriculture. This type of loan has the ability to help people purchase a home who would otherwise not be able to qualify for a conventional loan. Of the many benefits, the most noted is the ability to obtain one hundred percent financing. This means qualified borrowers can purchase a home with no out of pocket cost. Below are the top five benefits of having a USDA mortgage loan. So, the next question you may ask, well who is eligible for the USDA loan? First, any individual or family who plans to occupy a home located in an eligible rural area as their primary residence may qualify for a USDA mortgage loan. Grove City, Pennsylvania is considered a rural area, so we have you covered there. Second, when applying you must provide sufficient income verification and have a credit history that has indicated the ability and willingness to meet the repayment obligations. Third, you have to fall within the income guidelines. USDA mortgage loans are catered to the low to average income borrower, there is an income limit to qualify. Below is the link to the USDA government site to help you learn more and possibly get a pre-approval. Please call Grove City Realty if you have any questions, we help buyers work with lenders every day. Let us help you find the home of your dreams! FHA loans, what are they? An FHA loan is a mortgage loan that is backed by the Federal Housing Administration (FHA). FHA mortgage loans are very popular, especially with first time home buyers because the requirements are less strict than conventional loans. Borrowers can qualify for an FHA loan with a down payment as little as 3.5% of the purchase price and a credit score of 580 or higher. If the borrower's credit score is between 500-579, the down payment increases to 10%. It is important to remember, interest rates are still reflective of the borrowers credit score. There is one catch to the FHA mortgage loan, mortgage insurance. It requires two kinds of mortgage insurance premiums: one is paid in full upfront, or it can be financed into the mortgage and the other is a monthly payment. So, who can qualify for a FHA mortgage loan? Below are some key points you will have to meet. Borrowers must have a valid Social Security number, be of legal age and a lawful resident of the United States. Borrowers must pay a minimum down payment of 3.5%. Borrowers should have a minimum credit score of 580, you can have a score as low as 500, but it isn't ideal. Typically borrowers must be two years out of bankruptcy and three years out of foreclosure and have re-established good credit. When you look at the landscaping around your home, you may be frustrated by the amount of damage by pests – namely rabbits, porcupines, and OF COURSE DEER. These critters are trouble for your landscape plants especially in the winter when they're hungry. While no plant is entirely safe, you can greatly decrease the damage to your trees and plants but choosing ones which deer do not like as well. Instead of looking like dessert, you want your plants to look like an undesirable vegetable to the deer in your neighborhood. Many of the plants which are traditionally used for landscaping like yews, azaleas, rhododendrons, arborvitae, euonymus, plums and cherries, hosta, English ivy, and strawberries are frequent victims of deer. And you might as well just forget about lilies and tulips. Those are like candy on a stick. What can you do to decorate your home with flowers and landscaping that won’t end up in the stomach of our forest friends? First, check out some of the resources listed below. They can help guide you to the types of plants which deer find unappetizing. Second, check out some remedies such as Irish Spring soap shavings, dried blood (YUCK), old egg shells, or other environmental friendly ways to deter pests. Lastly, ask your local landscaping/greenhouse professional. She/he can help a lot by showing you some good alternatives that are appealing to look at, but may not smell or taste good to animals. While we like to see wildlife, we don’t want our gardens and landscaping to be their food supply. Use these tips to help keep pests away. Then you can enjoy your garden and still smell the roses. Conditions, Restrictions and Covenants? Oh, my!! How will they affect how I can use my property? When you find the perfect home or perhaps a lot to build on, you’re done right? Just move in and begin to make those changes that will really give the place your personal flair. Did you read the fine print? Those pesky details called conditions, restrictions, and covenants may change how you can use your property and they are REQUIRED READING when you look over the deed for a property. They may also be in a HOA document if you are moving to a planned community which has established rules as part of the development. Now most of these restrictions are put in place to protect the value of the property in the neighborhood-to keep it looking nice and well-maintained. Some restrictions, however, may put limits on your building or decorating plans, right down to the color you may paint your house. Most restrictive covenants “run with the land”. That means that it was placed in the deed at the time of sale as a permanent restriction that applies to ALL future buyers of the property. Sometimes a developer places these restrictions, sometimes a neighborhood group get together and voluntarily signs on to abide by the agreed-on rules. Want to build a fence? Put up a big backyard workshop or pool? Do your plans involve cutting down some trees? Maybe paint your home orange? Want to start a home business? Have an unusual pet? How about putting in security lighting or a basketball hoop or maybe you want to park your boat or camper in the driveway? Better check the fine print. If you're buying a property in a planned development, you must receive a copy of these Conditions, Covenants, and Restrictions (CC&R) AND agree to them as part of the settlement process. If you are buying a house or lot in a regular neighborhood, better check the deed just in case. It is better to find out before you commit to buying a property that you may not be able to use the way you like. Your Real Estate Agent is a valuable asset. In searching out the details of the property you have set your heart on make good use of your REALTOR. They can work with other professionals to protect your interests. Ask them questions about your dream property. Communicate your wishes to them so they can find what you are looking for. With their training and experience they can help you do your homework to find that perfect home. Today’s homebuyer has a powerful ally helping to find that new home. Real estate apps have popped up for every mobile device. They help to streamline the process by eliminating properties you know you don’t want to see and won’t consider buying. They save your time by not driving from house to house unproductively. These downloadable apps try to offer you the most up-to-date listings, information and offer details about the property, photos, and prices, updated regularly as they change. You can even have the app alert you if a home comes on the market in the price range or area you desire. The previous generation of home buyers did not have anything like this available. Zillow, Trulia, Redfin, realtor.com, homes.com all offer information about homes and seem like a one stop shop in your home buying experience, but beware there are some downfalls on only relying on apps and websites. Some apps and websites may appear to have many listings because they have not sorted out older ones that have been taken off the market, kept them up-to-date, or you may have set your heart on a property which has already been sold. You may see a property listed as pre-foreclosure or foreclosure, and these properties may never make it on the open market for buyers to access. They may be sold at Sheriff’s auction. When properties come on the market, the broker may have buyer clients who are an exact fit for it. In that case, a buyer who is already working with a broker has a clear advantage over an internet looker. The internet user who has no relationship with an agent, will never be the first to know when their dream home is available. The real moral of this story is: Real estate apps are educational and fun. They provide a lot of information that help a buyer ask good questions. They help inform the buyer about prices in an area. They let you know what is available in a given real estate market, and how fast homes are moving from the time they are listed. While apps are a great supplement to your home buying experience, they cannot take the place of a good working relationship with your real estate agent. When it comes to seeing, experiencing, and really knowing a prospective property, you need “boots on the ground”. This is where your real estate agent shines. He or she can lead you through the steps of financing, researching, and purchasing your new home, they’re committed by contract to work for you, helping you through the process, representing your interests and communicating with sellers on your behalf. As I am writing this, it is the first day of Spring. So, in terms of science The Spring Equinox is the first day of the spring season and occurs when the sun passes the equator moving from the southern to the northern hemisphere. On this day, day and night have approximately the same length of time. Exciting for us northerners who are clinging to the sight, smell, and feel of warmer weather. Easter is also approaching, which means this weekend is my bi-yearly trip to the Strip District in Pittsburgh to gather goodies for our families Easter dinner. Last year, I picked up some lemongrass from one of the markets, it was a Pinterest experiment, gladly it wasn’t a fail this time, but a huge WIN!! There is an abundant uses and recipes for this plant, I would say it was a good $3 spent for a plant that is not only super easy to grow, but is beautiful and beneficial to my health. If you're a GOT fan you know the line, "Winter is coming". However, I like to think "Spring is coming", well, because it is. March officially marks the month to start your seeds inside! It is the time we get to watch something tiny grow out of the earth and form life, something of which winter deprives us from seeing and for me it makes me hopeful for sunshine and warm nights on the porch. Added bonus, this is great activity if you have children, they love to keep a daily tab on the little plant in the window! Below is a great listing of vegetables and herbs to start now, inside. The link is below if you would like more information! March is the perfect time to get those tomato and pepper seeds started indoors ready for an early spring planting! 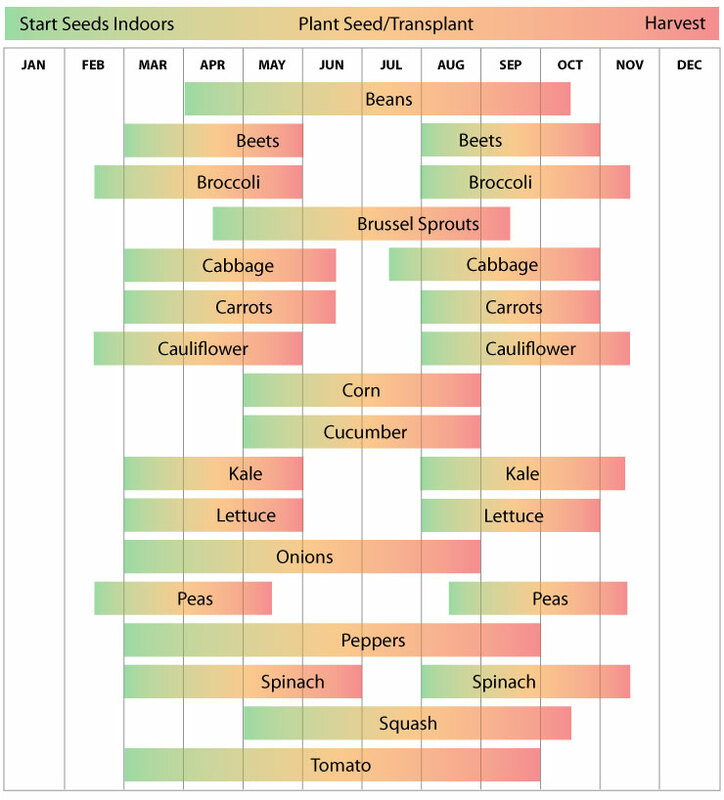 Also a great time to start planting those cool weather vegetables that can withstand those last frost days of March and April. A great time to try a Garden Shot! Superbowl Sunday is here and I LOVE to eat all kinds of dip when watching football! In the morning I will normally throw everything together and store them in the refrigerator, prepping makes my life easier! Right before game time I can put them in the oven so they’re ready for kick off. All I have to do is take them out of the oven, open a bag of chips, pretzels or a box of crackers and I have a plethora of dipping options without leaving my couch. So whether you are rooting for the Patriots or the Eagles, these dips will make your stomach cheer! Spread mixture in the bottom of a 9 inch pie place or shallow dish. Sprinkle 1/2 cup of the mozzarella cheese and 1/2 cup of the Parmesan cheese on top of the cream cheese mixture. Spread the pizza sauce over all. Sprinkle with remaining cheese, then top with green pepper, pepperoni, olives (or whatever topping you choose). Note: this dip is better if it sits in the refrigerator overnight to let the spices merry together. Also, it does better with bagel chips or a sliced and toasted baguette instead of chips since it is a thick type of dip. Mix all of the ingredients together in a large bowl and place in a greased, shallow baking dish. Everything is better with bacon….this phrase I wholeheartedly believe in. For example, green beans, by themselves are not the greatest, in my opinion. If you want opt out of drowning them in cream of mushroom soup, try this recipe. It isn’t going to win any health conscience awards, but your taste buds will certainly cheer! Combine the brown sugar, melted butter, soy sauce and garlic powder in a small bowl. Pour the mixture over the green beans and sprinkle crumbled bacon on top. Ps - I normally like to pair this side dish with grilled chicken or fish! There are a lot of you clicking on these recipes, so every Thursday we will be posting tried and true recipes, in hopes that you will enjoy them as well. My son told me the other day, “Mom, you make the best wings, ever! Can you make me some?”. I enjoy cooking and I enjoy, even more, when my children eat what I cook! Getting wings in a restaurant or even take out, can be expensive, so I have tried many different recipes trying to nail the ‘at home’ version. Let’s face it, I have two boys and their food intake is only going to increase, I needed to conquer the chicken wing. So, today, I am sharing with you my ‘unicorn’ chicken wing recipe. This is it, the golden ticket, the final one and I hope you enjoy it! Heat oil in a deep fryer to 375 degrees. The oil should be just enough to cover wings entirely, an inch or so deep. Combine the butter, hot sauce, pepper and garlic powder in a small saucepan over low heat. Stir together and heat until butter is melted and mixture is well blended. Remove from heat and reserve for serving. Fry coated wings in hot oil for 10-15 minutes, or until parts of the wings begin to turn brown. Remove from heat, place wings in serving bowl, add hot sauce mixture and stir together, serve. All Done! Of course you can use any brand/type of sauce that you would like. We also just eat them plain, with no sauce, for the littles and they’re still delicious. Enjoy!! With such a big response to last weeks one pot wonder, I thought we could share another favorite recipe of mine this week. This is not a long lost favorite, but one of my go-to meals. We, in Grove City, are expecting a winter storm over the weekend and this is a great slow cooker meal that makes your whole house smell warm and inviting all day. Enjoy and stay safe this weekend! All Done! Place shredded beef on your favorite bun or ciabatta bread. We love to put mayonnaise, horseradish and some banana peppers on our sandwiches. As I was searching for a recipe for a friend, I came across a this little delight. I keep my recipes in an old box and have completely forgotten most of them, but wanted to share this one with everyone. This one pot wonder is a quick and easy meal that is great for this time of year. It hits all of the points; hearty, warm and a little spicy (leftovers are great as well). I hope you enjoy it! Heat oil in large skillet on medium-high heat. Add chicken and onion; cook and stir 5-7 minutes or until chicken is cooked through. Stir in 1 1/2 cups water, mushrooms and liquid, bouillon cubes and noodles. Bring to a boil. Reduce heat to medium-low; cover. Simmer 10-12 minutes or until noodles are tender and only a small amount of the liquid remains. Stir in chipotle. Cook an additional 2 minutes, stirring occasionally. Remove from heat. Stir in sour cream. Serve immediately. The other day, my golden four leaf clover hanging above my front door caught my attention and was my unexpected muse for this blog. It was a house warming present, a lovely gesture, and on the back is the inscription, “One leaf is for hope, and one is for faith, and one is for love, you know and God put another in for luck”. So, you know what happens next. The thought train takes off and starts exploring other lucky charms that are seen in homes. I have seen horseshoes above doors and in barns, but what else? So, with the help of my friend, Google, we set off on a mission to find others. I have listed a few below and even one lucky charm that is said to help sell your home. The horseshoe has a long history of being a protective symbol. It has become customary to hang a horseshoe over the door to protect against evil and bring good luck. The way you hang the horseshoe is a matter of perspective. If the horseshoe hung pointing upward, it's believed your luck will not escape. If the horseshoe is hung pointing down, it's believed that good luck pours into the home. A traditional Native American practice known as smudging uses the smoke from burning herbs, most likely sage, to purify a space. Smudging is believed to clear away negative energy and bringing luck and positive energy. In the traditional practice, before you begin, you would open a door or window so the negative energy can escape. Then, you would place the bundle of herbs in a bowl, light them and gently blow out the flame so it would smolder, like incense. To dispose of the leftover ashes, practitioners recommend that you take them outside and leave them on the earth. St. Joseph is a Catholic saint long believed to help with home-related matters. Through the years he has become known as the patron saint of real estate. It is believed if you purchase a St. Joseph statue and bury it in your yard and say a series of special prayers, the right buyer will come along to purchase your home. Once the home is sold, the next step is to dig up the statue and place it in your new home for continued good fortune. The art of feng shui is an ancient Chinese practice of balancing the physical environment to promote harmony and balance, which is believed to bring positive outcomes. One prominent rule in this practice is to clear out clutter to allow a natural flow of energy, sounds like familiar advice from the home staging experts. Additionally, it is believed that a home should have a healthy combination of the five feng shui elements – wood, fire, water, earth and metal. Each element represents a different kind of energy and the type of outcome it cultivates. As it turns out, I have a money tree in my home as well, a popular plant used in the practice of feng shui. I purchased the plant for the intricate braided trunk, long green leaves and the easy to care for promise on the tag. What lucky charms do you have in your home? Maybe, you're like me and have more than one, from a practice you know little about. Red Doors, what do they mean? We have all seen brightly colored front doors on homes, the most popular color is red. The experts tell us it will improve the curb appeal of your home and make it more welcoming. But they're not the first to come up with this idea, it's an old practice from many different origins. This is what history is saying, about the red door. So, maybe having a red front door isn't all about having great curb appeal after all. When we take a moment and search history, we can discover many truths on why we do the things we do today.